The 4,500-passenger ship is the second Meraviglia-class ship to launch, and debuts in Southampton, UK, on March 2, 2019. 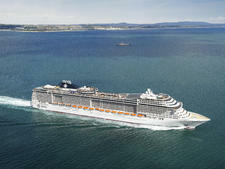 MSC Bellissima has the same layout and most of the same features as its older sister, MSC Meraviglia, which launched in June 2017. 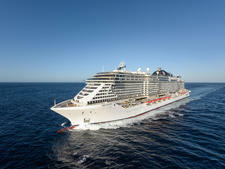 Bellissima features two new Cirque du Soleil at Sea shows, which were created exclusively for the ship. 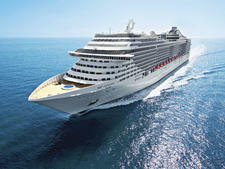 Bellissima also features cutting-edge technology which passengers can use to make payments, book spa treatments and specialty restaurants, as well as allow parents to geo-locate their children. 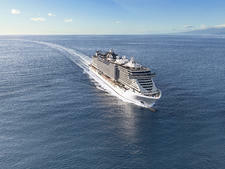 It also debuts a cruise first -- a voice enabled, artificial intelligence digital cruise "assistant" called Zoe, which will be placed in every cabin and is pre-programmed to answer 800 cruise-related questions. The device will be rolled out to all subsequent new builds. Another stand-out feature is an indoor promenade that has an 80-meter LED ceiling that projects different scenes throughout the day. It is the social center of the ship, featuring shops, restaurants and bars. 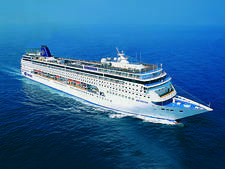 It is also home to the nightly parades, featuring the ship's onboard performers. All the Meraviglia Class ships have scrubber technology to neutralize carbon dioxide emissions; the ships will also be water emission free. 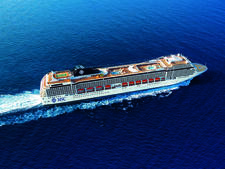 The ship has interlinked "cluster cabins" for family groups, which allow up to three cabins to be opened up to accommodate as many as 10 passengers. These feature two balcony cabins (one with a tub), with a tiny cabin sandwiched in between, complete with a virtual window. 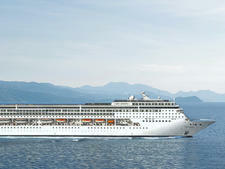 Bellissima also includes a number of solo cabins, which debuted on Meraviglia. 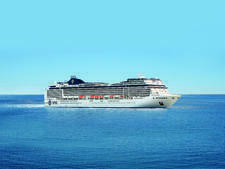 The ship also has the fleet's joint-largest MSC Yacht Club -- a luxury "ship-within-a-ship" triple-deck area with key card access for high-paying passengers. 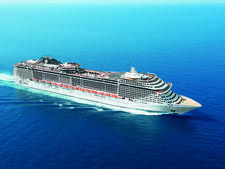 It include 78 suites, 15 inside cabins and two apartments. Each of the two apartment suites includes a large living room and two balconies, one of which is a large outdoor space that has a dining table for eating al fresco and a private whirlpool. The Yacht Club also features duplex suites, its own solarium, a small swimming pool, a large lounge and a restaurant. 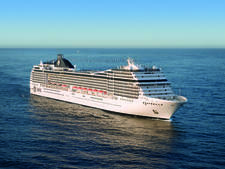 MSC has forged a relationship with a number of big-name chefs, including renowned French chocolatier, Jean-Philippe Maury, who has his own chocolate shop along the Promenade, or Galleria Bellissima. Spanish Michelin-starred chef Ramon Freixa, who has his own restaurant, Ocean Cay, on sister ship Seaview; has a new-to-the-line, for-fee tapas bar onboard Bellissima, Hola! Tapas, on the main promenade. Specialty dining options include Kaito Sushi Bar and the Kaito Teppanyaki Restaurant serving sushi during the day and in the evening, and offering a traditional Teppanyaki experience in the evenings. An American-style steakhouse Butcher's Cut, which has specialty meats from around the world and from Seaside and Seaview, popular French restaurant, Bistrot Atelier, makes its debut on Bellissima, again in the main promenade, replacing Eataly. The main dining room is divided in two by a corridor which features a stunning mirror and glass-encased wine cellar. The Marketplace Buffet is open 20 hours a day and will serve Mediterranean specialties and international cuisines -- including world food, cuisine based on where the ship is and healthy options. Cirque de Soleil, which made its at sea debut on Meraviglia, which will perform two exclusive shows six nights a week in a dedicated lounge, called The Carousel Lounge. The circular performance space with a 180-degree circular glass wall will feature cutting-edge technology and special rigging, and capacity for up to 413 passengers. 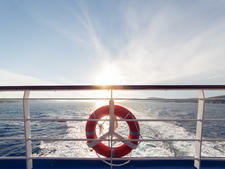 There are two new shows onboard -- Syma, or Sail Beyond Imagination; and Varelia, or Love in Full Color. Another big wow is the indoor promenade, Galleria Bellissima, which has an 80-meter LED ceiling that changes throughout the day, projecting different skies, patterns and even mini-movies. 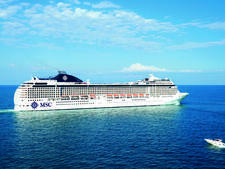 It is the social hub of the ship, featuring a double deck of shops, restaurants and bars. It is also home to the nightly parades, featuring the ship's onboard performers. 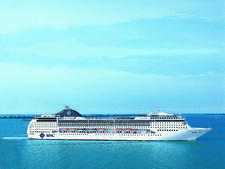 The ship has a double-deck indoor amusement park which includes a basketball court and doubles as a nightclub; and a double-deck aft lounge and entertainment space. 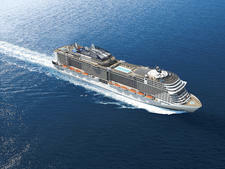 The main Pool Deck will feature a 25-meter pool and will have one of the most generous poolside spaces at sea (along with its sister). At night, the pool will be illuminated with special lighting. 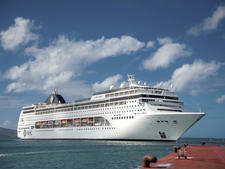 There is a 10-meter indoor pool with a dome that can be opened when the ship is in port or when the sun is out. The Aft Pool on Deck 16 will be an amphitheater-type space with tiered seating surrounding it in a semi-circle; at night it is transformed into a dance space. The ship also has a large outdoor water splash park for kids. 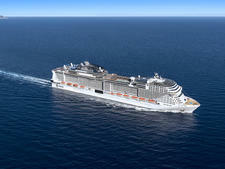 The kids' area is the joint-biggest on an MSC Cruises' ship, with separate rooms for different age groups, and including a baby room and a teen area. All the facilities for families, children and teens are in one place and include the Doremi Studio Lounge, a dedicated lounge for all family activities; and the Doremi Tech Lab, which includes a 3D printer. The baby room was designed in partnership with Italian babywear and manufacturer Chicco; the main kids' rooms are all LEGO-themed. 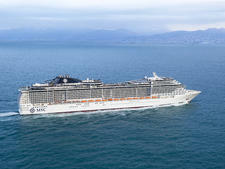 The ship will spend its first summer sailing the Western Mediterranean with three homeports: Genoa, Marseille and Barcelona. It then heads to the Gulf in December for the winter, before redeploying to China for 2020, where it will be based.